If you have been looking for a tutorial on how to root XXDMA6 Android 4.1.2 firmware on Galaxy Note 2 N7105, then you have come to the right place. The rooting method we described below is relatively easier as it won’t do much just push a modified kernel and install SuperSU. Root is required if you willing to install apps that require root permission or planning to install a hack or MODs. Follow this page to learn how to root Galaxy Note 2 4G N7105 running on N7105XXDMA6 Android 4.1.2 Jelly Bean firmware. In this article we will help you to root Galaxy Note 2 4G N7105 running N7105XXDMA6 firmware. For this we will flash a small .tar file using ODIN. However, in this process you may lose your personal data and settings. You should follow this guide carefully to properly backup your data that you can restore later. Rooting Information: Once your device is rooted, warranty will get void; However, you can reclaim the warranty by applying official firmware update. To check if you successfully rooted your device or not install an app called “Root Checker” that available for download from Google PLAY store for free. This tutorial is only for Galaxy Note 2, model number N7105. Don’t try this guide in any other Android device. Check your device’s model number in: Settings » About phone. Also, we are not responsible for any damage caused due to the instruction given in this page. Try this at your own risk. Although, it is very unlikely that your device will be damaged if you follow all the instructions as it is which are mentioned in procedure. Backup your data first using below mentioned instructions, so that if you lost any data you can recover it easily. Contacts & Settings – Use Android default backup options. Images, Songs, Videos, Files – Copy to Internal/External SD card. If you follow everything that we mentioned above, you are ready to move into next page of this guide where we summed up detail instruction on how to root Galaxy Note 2 4G N7105 running N7105XXDMA6 firmware. In this page you will learn required steps to root Galaxy Note 2 4G N7105 running XXDMA6 Android 4.1.2 Jelly Bean firmware. The process is quite simple. First you need to download CF-Auto-Root-t0lte-gtn7105.zip and ODIN zip. Then follow the below mentioned guide to get root Galaxy Note 2 4G N7105. Rooting your Galaxy Note 2 4G N7105 will void manufacturer warranty. Though root usually not effect your phone data but it’s advisable to follow pre-requisites that we mentioned in previous page as precaution. By following this instruction you only receive root. You have to install custom recovery such as CWM recovery separately to flash custom ROMs or hacks in your Galaxy Note 2 4G N7105. This root process may increase binary flash counter. Extract downloaded CF-Auto-Root-t0lte-gtn7105.zip file and you will find a .tar.md5 file within it. Extract Odin zip file and you will get Odin3 v3.07.exe along with few other files. Power off your phone. Wait 5-6 seconds for vibration to confirm complete switch off. Now, put the Galaxy Note 2 4G N7105 phone in Download Mode by pressing pressing and holding down the Volume Down and Home buttons while pressing the Power button. A Warning! screen will come up; press Volume Up button to enter Download Mode. Now run Odin3 v3.07.exe (see Step 2) as an Administrator because Admin privileges is required to complete the process smoothly. Now connect your Galaxy Note 2 4G N7105 with your PC using USB cable. A message will arrive under Odin’s message box in the bottom left saying “Added!!”. If you don’t get the same then you should try another USB port (try USB port located in back in your desktop PC). If that too don’t work then you should then reinstall the driver. If you successfully see the “Added! !” message in Odin then you are ready to go in next step. You should also see COM port with a number in Yellow if you successfully added your device. Click the PDA Button, and select the CF-Auto-Root-t0lte-gtn7105.tar.md5 file. In Odin window, make sure Auto Reboot and F. Reset Time checkboxes are selected. Double check everything that we mentioned. Now, once satisfied hit the START button to begin the flashing process. Once flashing completed, the phone will restart automatically and soon you will see a PASS message with green background in the left-most box at the very top of the Odin. You can now unplug the USB cable to disconnect your device from computer. Congrats! Your Galaxy Note 2 4G N7105 running N7105XXDMA6 Android 4.1.2 Jelly Bean firmware is now rooted. You can now install apps that require root access. To verify your device is rooted or not follow this guide: How To Verify Android Device is Rooted or Not. KSUAMA1 Android 4.1.2 Jelly Bean update for Galaxy Grand SHV-E270S is now available for download. You most likely know that Galaxy Grand SHV-E270S is now only available in South Korean. Many Galaxy Grand SHV-E270S users already received KSUAMA1 Android 4.1.2 Jelly Bean update in their smartphone via OTA. Other can also download and install this firmware to their smartphone using official utility KIES. However, if both processes not work for you then try manual installation. Continue reading this article to download KSUAMA1 Android 4.1.2 Jelly Bean firmware and then manually install it on your Galaxy Grand SHV-E270S. Galaxy Grand SHV-E270S comes with a 5.0-inches Capacitive touchscreen display. This awesome phone is powered by dual-core 1.2 GHz processor and a 1 GB RAM along with several impressive hardware portfolio. In this article we will guide you to install KSUAMA1 official firmware update in Galaxy Note, model number SHV-E270S. For this, we will use a tool called ODIN that will help us to flash the stock 4.1.2 Jelly Bean firmware in Galaxy Grand SHV-E270S . However, in this process you may lose all your existing installed apps and personal settings. You should follow this guide carefully to properly backup your data that you can restore later. Please note, this is a leaked firmware and may contain several bugs and issues. This tutorial is only for Galaxy Grand, model number SHV-E270S. Don’t try this guide in any other Android device. Check your device’s model number in: Settings » About phone. Also, we are not responsible for any damage caused due to the instruction given in this page. Try this at your own risk. Although, it is very unlikely that your device will be damaged if you follow all the instructions as it is which are mentioned in procedure. If you follow everything that we mentioned above, you are ready to move into next page of this guide where we summed up detail instruction on how to flash Jelly Bean E270SKSUAMA1 Android 4.1.2 official firmware update for Galaxy Grand SHV-E270S. In the last page you learn what to do before flashing KSUAMA1 Android 4.1.2 Jelly Bean firmware update. Now, in this page you will see how to update Galaxy Grand SHV-E270S to KSUAMA1 Android 4.1.2 official firmware. The step-by-step guide is pretty easy to follow. First you need to download E270SKSUAMA1 firmware zip and ODIN zip, then follow below mentioned guide as it is. You will lose installed custom ROM such as CM10, Paranoid Android or AOKP after flashing official firmware. Custom ROM will be replaced by official stock ROM. Though official firmware update usually not erase any system data but we advise you to follow our per-requisites mentioned on previous page as precaution. This firmware released by Samsung and flashing of this won’t increase binary counter. Extract downloaded archive only once and not twice. If extracted zip don’t contain any modem, csc or pit file that actually means you don’t require it. The only must have file for a firmware flashing is that file with .tar.md5 extension which should be flashed through PDA section. To run ODIN as Administrator you should right click on .exe file then click on ‘Run as administrator’ from context menu. Windows XP or lower don’t require this. Extract Firmware zip file that you downloaded already from above link, you will get a .tar file and some other files. Now, put the Galaxy Grand SHV-E270S phone in Download Mode by pressing pressing and holding down the Volume Down and Home buttons while pressing the Power button. A Warning! screen will come up; press Volume Up button to enter Download Mode. Now connect your Galaxy Note GT-SHV-E270S with your PC using USB cable. A message will arrive under Odin’s message box in the bottom left saying “Added!!”. If you don’t get the same then you should try another USB port (try USB port located in back in your desktop PC). If that too don’t work then you should then reinstall the driver. If you successfully see the “Added! !” message in Odin then you are ready to go in next step. You should also see COM port with a number in Yellow if you successfully added your device. Click the PIT Button, and select the .pit file. Use only if you got it while extracting in step 1 above, otherwise ignore it. In Odin window, make sure Auto Reboot and F. Reset Time checkboxes are selected. Also, make sure that Re-Partition checkbox is selected, only if you are using a .pit file (see Step 7.4). Double check everything that we mentioned in Step 7 & Step 8 above. Now, once satisfied hit the START button to begin the flashing process. Once flashing completed, your phone will restart and soon you will see a PASS message with green background in the left-most box at the very top of the Odin. You can now unplug the USB cable to disconnect your device from computer. Congrats! Your Galaxy Grand, model number SHV-E270S should now run on Android 4.1.2 Jelly Bean build KSUAMA1. Go to Settings > About phone to verify this firmware update. If Galaxy Grand SHV-E270S stuck at booting animation after Step 10 then go to recovery mode (press and hold the Volume Up, Home and Power buttons together) and perform Wipe data/Factory Reset task before selecting reboot system now function. In recovery mode use Volume keys to navigate between options and Power key to select the option. Also worth noting…Google+ is now the world’s second largest social network, topping Twitter and YouTube this week. While Facebook shouldn’t be shaking in their boots just yet, this is very impressive for a social tool barely a year and a half old. 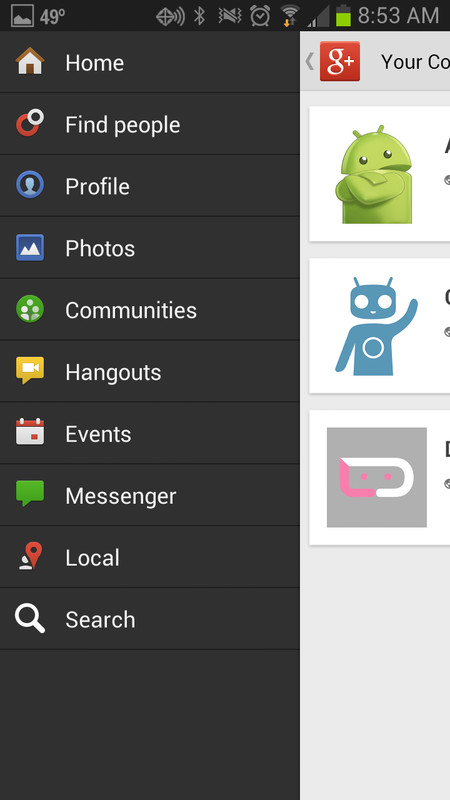 If you don’t Google+ installed, head over to the Play Store and pick it up.